Atlas Chiropractic System is a complete EHR solution specifically designed to provide for a comprehensive range of chiropractic office needs. It is easy to set up and includes Sign In, Touch Screen Notes, X-ray Analysis, Scheduling, Electronic Billing and Reconciliation, Marketing Analysis, Patient Education Videos, Articles, Care Plans, and Merchant Services as well as many other features. Sign up for a custom online tour at www.atlaschirosys.com. 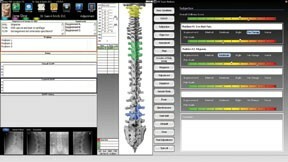 Atlas Chiropractic System is a complete EHR solution that is currently in use in 18 countries around the world, and offers flexible paperless innovation to accommodate a wide variety of sizes and types of chiropractic practices and philosophies. Atlas was specifically designed to provide for a comprehensive range of chiropractic office needs. Not all chiropractors practice in the same manner so it stands to reason that not all of their offices are similarly managed; Atlas Chiropractic System was purposefully created to accommodate the individual needs of chiropractic workplaces, from pay-per-service to health investment plans to PI and insurance. Atlas is easy to set up and includes Sign In, Touch Screen Notes, X-ray Analysis, Scheduling, Electronic Billing and Reconciliation, Marketing Analysis, Patient Education Videos, Articles, Care Plans, and Merchant Services as well as many other features. And, Atlas Chiropractic System's innovative screens are the result of 40 years of computer design experience and input from their users. To learn more about how Atlas Chiropractic System can help you save money and become "overhead liberated," and for a complete list of features, Atlas encourages you to visit their website where you can sign up for a custom online tour.